Download Monboddo Poster as PDF. The Performance tells the true story of a dazzling scientific discovery set during the Scottish Enlightenment – and how revolutionary thinker Lord Monboddo, his brilliant daughter Eliza, and poet Robert Burns risked all in the pursuit of truth. The plot centres around James Burnett, Lord Monboddo, (25 October 1714 -26 May 1799) Scottish Judge, scholar of linguistic evolution and philosopher. Monboddo was one of a number of scholars involved at the time in development of early concepts of evolution. Some credit him with foreseeing in principle the theory of natural selection which was developed into a scientific proposal by Charles Darwin around 100 years later. His wife Elizabeth died young but left him with two daughters and a son. The younger daughter Eliza was a well known celebrity around Edinburgh, renowned for her beauty and amiability. Monboddo’s friend Robert Burns had a strong romantic interest in Eliza but tragically she died of consumption at the age of 25. Following her death Burns wrote a poem for her, Elegy on the late miss Burnet of Monboddo. It is said that Burns was in love with Eliza and never fully recovered from losing her so tragically. 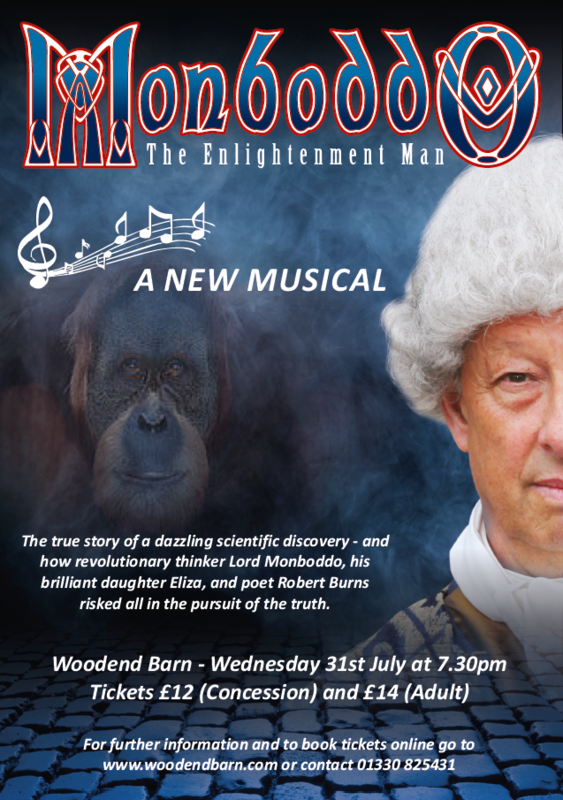 We explore Monboddo’s life and times featuring both the evolution of Man and the Burns association within a cleverly crafted script which takes the audience from comedy through drama to tragedy and triumph. The story is enhanced with the use of cutting edge lighting and effects, stunning scenery and 16 brilliant songs specially written for this production. Copyright © 2013, St. Nicholas Productions Ltd.
Scottish Charity No. SCO 13896.